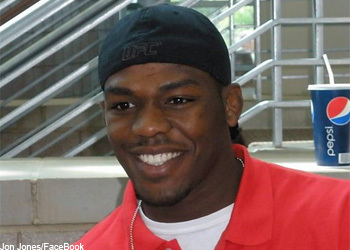 In the ‘Look at Me Now‘ driven world we live in, skyrocketing superstar Jon Jones has discovered a way to remain grounded in his pursuit of greatness. “I think once you start to think that you’re the man, and you know it all, and your style is unbeatable and stuff like that, that’s when you get caught and clipped, and get humbled really fast,” Jones told MMAWeekly.com. “Bones” owns a dominant 10-1 professional record and has finished in eight of those wins. His sole blemish come in a controversial DQ against Matt Hamill at “The Ultimate Fighter 10 Finale” in December 2009. It was a scrap he appeared to have well in hand. Instead of whining about the loss, Jones viciously bounced back by carving up Brandon Vera’s face with his elbow. The 1stRound TKO victory was likely the most impressive performance of his career, but it’s tough to tell given his extensive highlight reel collection. Despite having time on his side, the 23-year-old’s quickly shooting the inexperience gap by doing extra credit homework. “The biggest thing is that I’m getting more confident with each fight,” Jones explained. “Just becoming more experienced with each fight. It’s just exciting, I can sit home and watch my own fights and realize what I’m not doing good, and what I’m doing good. I’m just a real student of the sport. Jones faces a wily veteran in Vladimir Matyushenko this Sunday at “UFC on Versus: Jones vs. Matyushenko” inside the San Diego Sports Arena in California. While Vlad may not make it on most trendy Light Heavyweight V.I.P. lists, he’s clearly the most decorated opponent Jones has faced.